After a recent difficult project which took longer to build and was harder then expected, I needed an easy fun project to build. And, with Christmas coming right around the corner, I thought some game boards were in order. They always make nice, small presents. 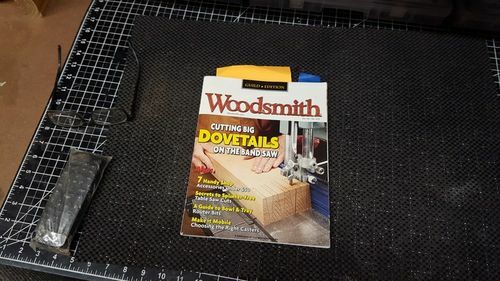 So, I happened to get Woodsmith issue 223 in the mail and it had three different game board builds in it. I chose the Checker Board game. It was a lot of fun to make and not hard at all. I used up some Maple, Sapele, Cedar and Mahogany shorts I had on the shelf and went at it. It turned out so fun, that after I had my set-ups dialed in, I made ten of them before I knew it. The pocket where the checkers are kept was routed out with a bowl bit. I used the suggested barrel hinges on most and made a couple with book binding backs to change it up a little, and installed rare earth magnets in all for closures. Those rare earth magnets are really powerful and will make sure the checkers don’t come out. After staining the darker square with General Finishes Java gel stain, I finished the boards up with some spray lacquer. All in all, it was some very fun shop time, and I hope the people who receive them like them. (is that still proper to say) ? Nice work on the boards, Eric!! Wow – you were busy! Nice work on a cool gift idea! Nice project Eric! 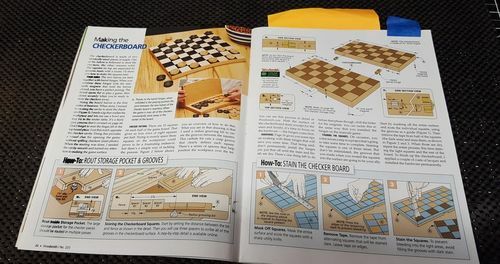 It’s nice to have a place to store the checkers and the magnetic catch is a great idea. Nice work, Im sure those who receive them will be most appreciative. Did you sign and number them so they’ll be special limited editions? Great work Eric. Hand-made gifts (think loving heart) are best and always welcome and appreciated. Did you make the checkers on your own too? Those are really Cool, Eric! I like that “book binding” hinge. You did a fine job on these game boards and they looks nice. Eric, , nice job and congratulations on your ‘Daily Top 3’ award. Nicely done Eric, these will make great Christmas gifts. There will sure be some happy faces.